Inaugurated in the year of 2015, we "Sahana Engineering [Pune]" established ourselves as a prominent and reliable organization of the industry by supplying, trading and distributing a wide array of Level Transmitter and Level Indicator. Under our quality approved the collection of products we are presenting Level Transmitters, Level Indicators and Level Switches. Offered products are supplied from high-grade components with following industry norms and standards. Our offered products are highly admired in the various fields for their accurate results, high performance, and excellent finishing standards. Apart from this, we are offering these products at budget-friendly prices within the assured period of time. All our offered products are passed through stringent quality assurance procedures to ensure their quality. We have constructed a highly advanced and well-equipped infrastructure unit. Our unit is equipped with all the required machines and tools. Also, we have hired a team of qualified professionals to handle all our business operations. We have recruited our team of professionals after assessing their previous working experiences and domain knowledge. We are able to deliver the products on time and safely at client premises with the help of our well-connected distribution network. Under the visionary direction of our mentor Mr. Madhu N., we are able to create such a commendable niche in the market. Owing to her domain expertise and vast knowledge, we are increasing our reach across the nation. With the Help of our vendor team and his top-notch infrastructure we are able to offer these quality products. Our vendor unit is equipped with all the updated tool, machines and latest technology for the production of these level indicator and transmitter. there facility is regularly checked in order to match the current needs of the market. We are able to deliver these products on time and safely at client premises with the help of our well-connected distribution network. 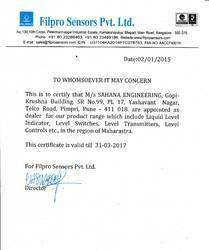 Our company is authorized distributor of Filpro Sensers Pvt. Ltd.
Venus Wire Indutries Pvt. Ltd.